Joyce Fruge presents the Associate logo lapel pin to Mary Veen. 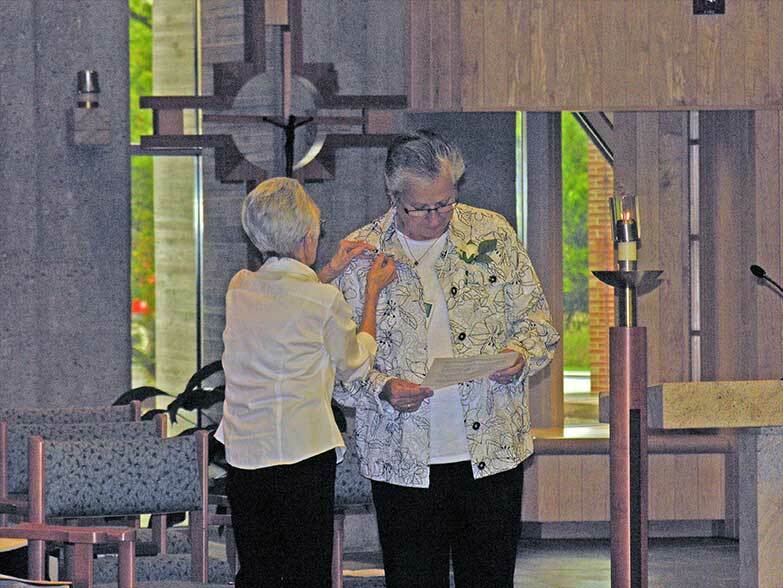 August 24, 2016, Adrian, Michigan – Mary Veen, a former Adrian Dominican Sister, formally reconnected with the Congregation as an Associate on August 13 during a special Ritual of Acceptance. The brief ceremony was held during Partners IV, an annual gathering of Adrian Dominican Associates at the Motherhouse in Adrian. Associates take part in the Ritual of Acceptance. Associates are women and men, at least 18 years of age, who make a non-vowed commitment to partner with the Adrian Dominican Sisters. While maintaining their own lifestyle and remaining financially independent, Associates participate in various spiritual, social, and ministerial experiences with the Sisters, and attend Congregational events. Mary, of Cheboygan, Michigan, is a mother and grandmother who has been widowed since 2012. 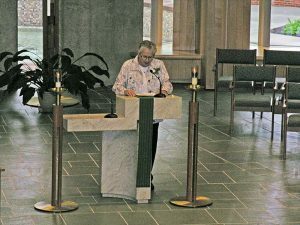 She has been active in the Cheboygan Catholic Community as a sacristan, Eucharistic minister, lector, funeral minister, visitor to the sick, and leader at communion services. In addition, she volunteers at the local food pantry and works as a substitute teacher. Mary Veen declares publicly why she feels called to be an Adrian Dominican Associate. In speaking of her desire to become an Associate, Mary noted the gift of the Dominican spirit and charism that she had received in June 1957 when she entered the Congregation as a Sister. 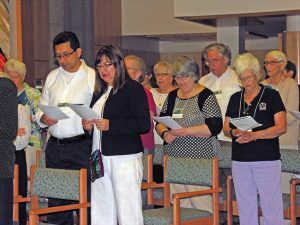 In the past years, she said, her love, care, and witness to people have been “the focal point of my life.” Still, she said, she felt that something was missing: the community with the Adrian Dominican Sisters. It was that sense of community, she said, that drew her to Associate Life. “It is my desire to reconnect with the Adrian Dominican spirit, which continues to pervade my daily life,” she said. After proclaiming her desire, Mary signed the Agreement of Association, a formal document that states her willingness to participate in the life of the Adrian Dominican Congregation. Her mentor, Joyce Fruge, Associate, presented her with the Adrian Dominican Associate logo as a symbol of her commitment. 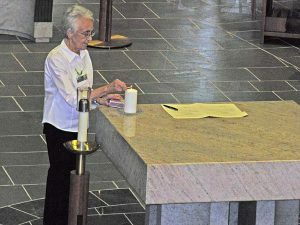 Joyce Fruge, mentor of Mary Veen, lights a candle in gratitude for Mary. Those interested in exploring the idea of becoming an Adrian Dominican Associate should contact Mary Lach, Associate and Director of Associate Life, at 517-266-3531 or mlach@adriandominicans.org.